For some reason or another, my older brother gave me my first camera back in what I remember being 1987. He purchased the Pentax Super Program 35mm film camera from someone at work and it started me on my eventual professional career in photography. I remember seeing the cheap blue camera bag on the carpet of our house and marvelling at this magnificent silvery machine with mysterious knobs and dials. I can still smell the silica gel desiccant packets that were inside the black lining of the bag. The camera came with a 50mm, a 70-210mm, some filters, and another lens or two not worth mentioning. Those other lenses turned out to be really cheap quality and took Instagram quality images. Attached to the camera was also one of those awesome retro camera straps that are sadly found on hipsters who are using retro cameras such as that Pentax. I loved that camera but it wasn’t my first as I do remember my mother had a 110mm Kodak that I captured some of my first childish imagery on it’s tiny negatives that are still somewhere in the house on Huisache St. I guess my brother saw something in me and thought maybe I had some talent with photography. I guess he was right because I’ve made my career of taking pictures starting about the time I walked out into the world with that Pentax. The camera still sits on a shelf near all the new fancy stuff. I almost threw it out but Sweetie made me realize the importance of that gift. I would imagine the camera still works if I put a fresh set of batteries in her. As the last of the photo labs close in Hawaii, the Pentax becomes a relic lost within the pixels of the digital age. Thank you Brother for the most significant camera that helped start my career. But to tell you the truth, you should have given me a damn stethoscope! My father once used to brag about all the countries he went to with the Army. Lots of those new people my father encountered wanted to kill him and his buddies but thats the nature of traveling with the military. My travel adventures, on the other hand, (Central America, Mexico, Asia, Europe, etc…) rarely took the form of digging trenches and eating c-rations, although many of the things I ate made my father’s MREs into candy. Dog, anyone? My first encounters with Tokyo were absolutely amazing…nothing could have prepared my little shallow San Antonio mind for the mind blowing excitement of Tokyo. Bright lights, big city! So many people whose faces were so different than mine, fashion, trains, buildings, signs written in Japanese and none of it I could read! It was all so different. 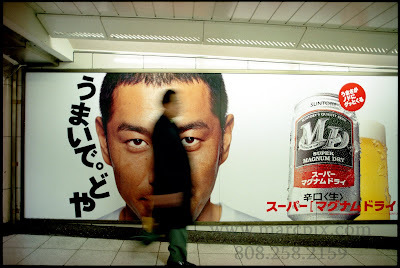 One of the most striking facets of Tokyo life was the barrage of advertisements: from neon billboards toting the newest J-Pop stars, to beer, to tea, to cell phones…endless amounts of selling in every imaginable place. And everything was larger than life ads. 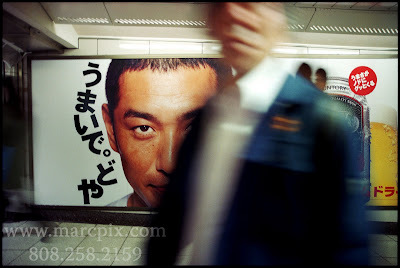 Huge photos pasted on walls, subway halls, hoisted on building, gleaming with that language I still can’t understand. So unique. 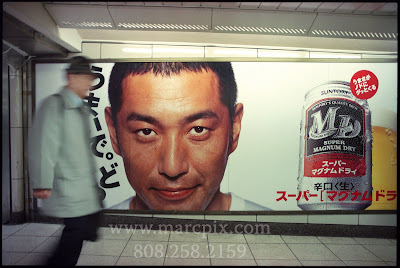 My first photo travails with my Nikon allowed me to capture and record human reaction with such advertisements. How small and little we are compared to these larger than life ads. At the time, I though I couldn’t have taken a better photo. The timing, emptiness…the image itself growled back at me. I though I knew so much about photography and myself and I was ready to launch a career. But as I now work on a new portfolio showcasing images from Tokyo over a 10+ year experience, I quiet a different story and view. While editing and choosing new images, I came across the original negatives (YES NEGATIVES!) and I re-edited the image. There were so many different angles I didn’t blink an eye at and actually forgot about the scene. My editings led me to see a variation of different scenes. Different angles, different thoughts. An unfamiliar look at what I though was one of my better images. Mysterious blurs, people ghosting in the shot. I wasn’t sure why my original “cat’s meow” doesn’t strike me any longer but maybe its my growth as a person, my experiences, all the things that have made me into a professional. I don’t know. My hero shot would now take a back seat to the others I think duly take the winning slot as a moment. Oddly enough, my last trip to Tokyo this past May produced a very familiar image. 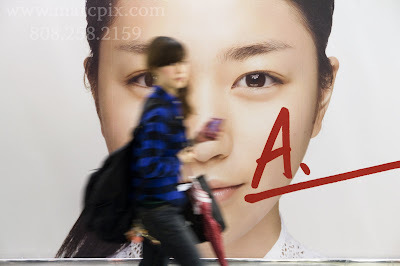 It is not as if I though to frame this image as such but the poster, the look on the model, and the motion of the blurry Japanese girl truly captures a moment in Shinjuku Station Essentially its the same shot as my original. Different time, different medium, different me. Yet something struck me again about my life and how experience has defined me in my mid 30s’. I remembered an amorous letter I wrote long ago during a trip away which I prosed the following: “…the only thing I can share with you while I am so far away is the moon… as it will always be the same… no matter where you are…the moon is always the same…” or some insane dribble about something or another. I doubt the validity of what I wrote back then but it made sense but it was the musings of a young romantic. A romantic before the reality of life took hold. (What? Charm can’t get me through life?) I though U2, rum, and a dirty school bus trip through Nicaragua defined it all. I guess what I am trying to get at is no matter how much I have changed as a person, I am still like the moon…meaning I am still me. I haven’t changed nor has my view changed on what I see. Experiences have made me different but I am still me. I still see what I do and I capture what I want. Do I ever miss photos when I don’t have a camera, do I miss moments? Sure but it doesn’t matter cause I wasn’t there to capture it.